A travel book or website can give you an overview of a vacation destination. You could consider a VIP guide to walk you around the World for hundreds of dollars per hour. Well, we can’t go with you but you’ll feel like we are when you see your personalized custom itinerary! 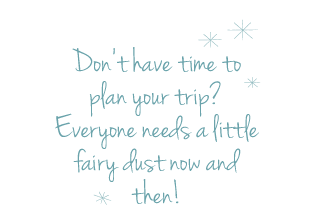 For the Disney vacation you’ve always dreamed of, you need a Fairy TripMother! Our Fairy TripMother itinerary planning service can help you make the most of your vacation. We offer this valuable service in addition to all we do for you as your travel agent. 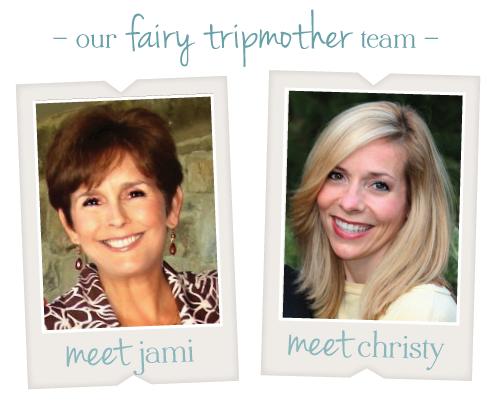 Your Fairy TripMother, Jami or Christy, will get to know you and tailor your family’s vacation wishes into a dream vacation. From finding the characters you want to see to pinpointing the best spots to view the parade, we’ll give you our greatest and most prized Disney vacation tips! We have researched and studied Disney for over fifteen years. As moms who travel to Disney with our own families, with friends and even together for research, we are confident that we can build a wonderful touring plan for you. We have helped over 500 happy families navigate the parks and make magical memories! We will spend approximately twelve to fifteen hours creating and writing your vacation itinerary! Just before you depart, you’ll receive your custom folder. We will review it with you and teach you how to tour the parks with ease. We will also be on call during your vacation to answer any questions you have while you are there. your wait time. Our top priority is to help you avoid long lines. Dining Reservations that coincide with your touring plans. Pre-arranging all of your FASTPASSES. know if it is a fit for them or not! Explanations of the bus system, dining plans and parent swap passes. All of our Disney knowledge and tips; maximizing your time and minimizing your stress level! Itinerary planning for up to 4 park days starts at $400. Additional park days will be $100 per day. Due to high demand, seasonal rates will apply during Fall Break, Spring Break and holidays. We can only accommodate a limited number of families, so book early to get on our schedule! Want to go with several families or your extended family? We specialize in that too! Grand Gathering Itinerary Services for large parties (8 or more) start at $700. We can write itineraries for your family for other Orlando theme parks!